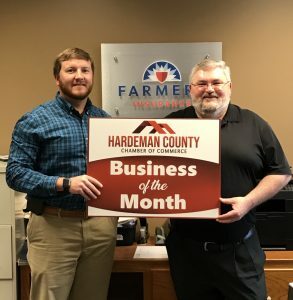 The Hardeman County Chamber of Commerce Business of the Month is Farmers Insurance-Howell Agency. Howell Agency was established in 1991 by Jimmy Howell. Jimmy built the business from the ground up. In 2008, his son, Justin Howell, began working alongside him. They believe in running their business by creating strong relationships with their clients and operating with high levels of confidentiality and ethical standards. At Howell Agency, clients are family—not numbers in the computer. Howell Agency offers multiple types of policies and considers each clients level of risk to make sure all of their insurance needs are met. Available plans include auto, home, condos, renters, mobile homes, vacant homes, vacant land, motorhomes, umbrellas, individual health, group health, Medicare supplements, Medicare advantage, annuities, long term care, life, general liability commercial, workman’s compensation, antique auto, motorcycles, ATV’s, boats, golf cares, travel trailers and SR 22’s. Their office is located at 1303 West Market Street in Bolivar and can be reached by calling 658-4982, Monday-Friday from 8:00 am-5:00 pm. Jimmy and Justin are life-long residents of Hardeman County and love being a part of the community here. They give back in many ways. Howell Agency is a member of the Bolivar Rotary Club and the Bolivar Lions Club. Each year they sponsor a Lions Club baseball team and have supported several Chamber programs. Please join us in celebrating Farmers Insurance-Howell Agency’s contributions to our community, local economy, and to the Chamber.